The lost souls of Pelléas et Mélisande inhabit a castle; their drama takes place in a forest by the sea. Director Stefan Herheim initially toyed with the idea of setting it inside a space station after the world’s end, with the family not knowing where they had come from, but his search for a suitable location finally drew him back to Glyndebourne. That is what Glyndebourne does to those who stage operas there: it often gets referenced in productions, usually tongue-in-cheek. This time the reference is serious: for Herheim the mystery of this Sussex retreat resides in its atmosphere and its inheritance, in its isolation, its gardens, its sheep, and its house in which ‘a family is filling the aristocratic vacuum by producing art’. David Hare’s new play The Moderate Soprano deals explicitly with the history of this opera house in a sophisticated rumination on art and society. Herheim’s take is costumed to chime with the period of its work’s creation, but – set in a simulacrum of Glyndebourne’s baronial Organ Room, over which a massive pipe instrument silently presides – it’s a quintessential exercise in Symbolism. Philipp Fürhofer’s designs are lit so that the protagonists stand out like alabaster figures in the surrounding gloom: it’s all very painterly, and indeed painting is the guiding visual theme. This Pelléas creates paintings – some real, some imaginary – which illustrate the story; the pipes of the organ – sometimes suggesting pillars, sometimes trees – are in constant gentle movement. It’s like a series of works by Fuseli, across which the singers and their silent retinue of servants move in slow motion. But the plot is at times perversely embroidered, there are moments of clumsy directorial interference with the score (most notably when the work’s sublime final bars are muddied by the incursion of a group of sight-seers, aka us in the audience), and there’s one piece of outrageous travesty. The scene in which Golaud lifts Yniold up to the window to spy for him on the chaste lovers depends for its sexually-charged effect – an amalgam of innocence and voyeuristic pain – on the vocal contrast between piping treble and resonant baritone. By casting a female mezzo as the little boy, that contrast is lost. And if this is bad, what follows is worse: Golaud strips Yniold – who suddenly sprouts tresses like Mélisande’s – and rapes him from behind. One can see a clunky kind of psychological logic here, but this crude and puerile interpolation completely betrays the message of the music. Yet in musical terms this is otherwise an enchanted evening, thanks to super-sensitive playing by the London Philharmonic under Robin Ticciati’s direction, and to some outstanding performances. Brindley Sherratt, with a throat infection, had to walk his way through the part of Arkel, which Richard Wiegold sang magnificently from the side (a visual disconnect which ironically served to intensify the symbolism of the production). 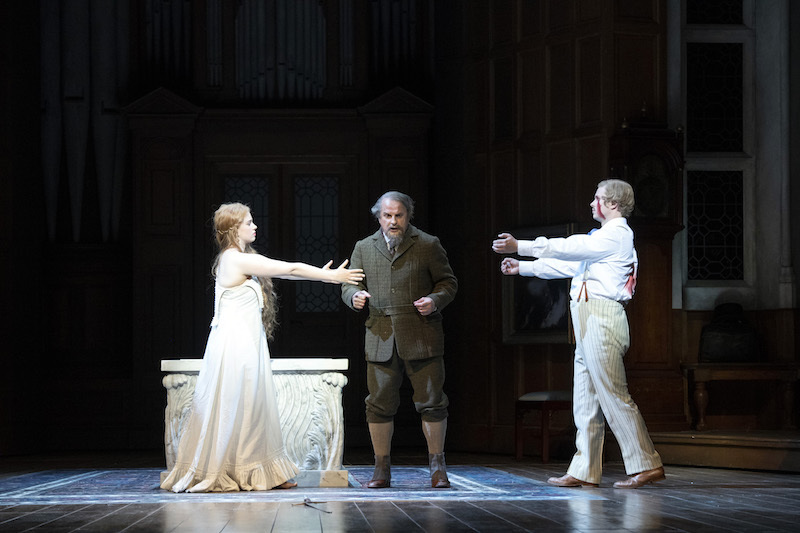 Christina Gansch’s Mélisande is a delicately-conceived creation, while Christopher Purves and John Chest play off each other as Golaud and Pelléas to wondrous effect. Golaud’s rage and pathos is heartrending, while Chest’s warm baritone pervades the story with a thread of marvellously sustained beauty. Nineteen years ago Glyndebourne staged Graham Vick’s brilliantly successful Pelléas. If Paul Brown’s gorgeous sets for that haven’t been junked, Glyndebourne should now dust them off and remount that production, using the current excellent cast. That really would be something.